In this post we are going to construct a modified sine wave inverter circuit using IC 555 and IC 4017. Modified sine wave inverter sometimes also known as modified square wave is an upper segment inverter design, above the simple square wave type. We will explore the proposed inverter circuit stage by stage. What is modified sine wave inverter? Difference between square wave and modified sine wave inverter. Circuit Diagram of Modified Sine Wave Inverter. Modified sine wave inverter is a classification of power inverters whose wave form and power quality is superior to basic square wave inverter. The modified sine wave inverter’s wave form stay at zero volt for some time before any change in polarity. 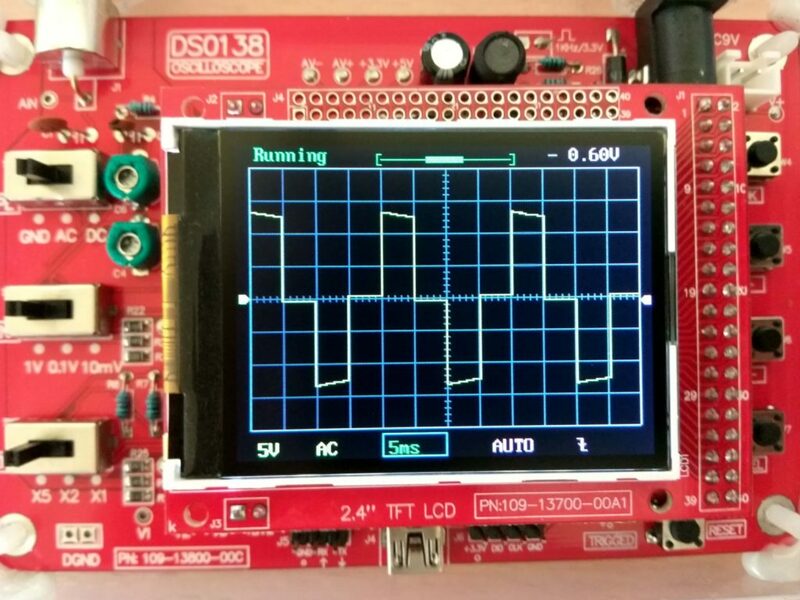 The wave form in green colour represents square wave and the red colour represents the modified sine wave. The square wave changes its polarity abruptly, but the modified sine wave stays at an intermediate point (zero volts) before any change in polarity. By simply keeping the wave form at zero point for some milliseconds it will reduce noise at the output, but modified sine wave cannot be compared with pure sine wave. Now you the core difference between square wave and modified sine wave. The oscillator circuit produces the necessary clock signal for this inverter, so we can call this stage as the heart of the inverter. The 555 timer is an ever green IC and we are utilizing it as oscillator. Our requirement is to produce 200Hz square wave at 50% duty cycle which will be divided by four by IC 4017 to get 50Hz AC modified sine wave output. 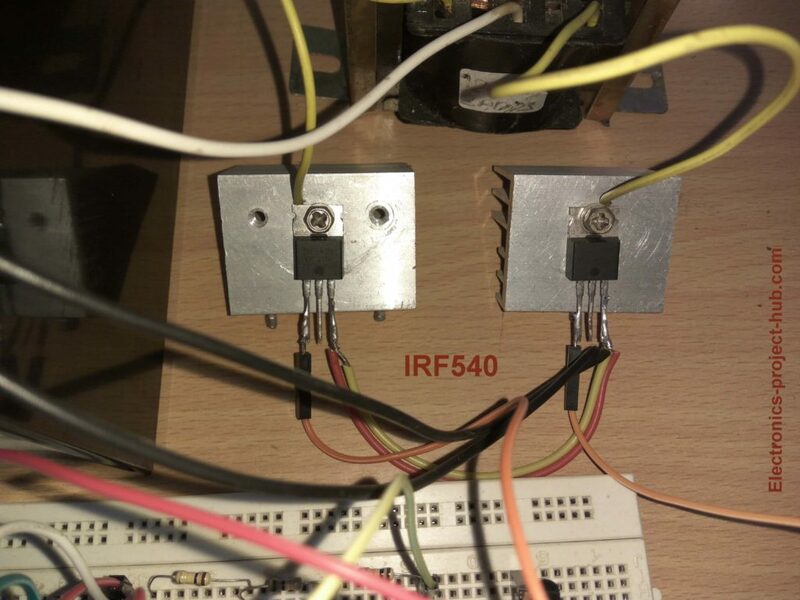 IC 555 is connected to a RC network of two 36K ohm resistors and one 0.1 uF capacitor and a diode is connected across pins 6 and 7 to get 50% duty cycle from IC 555. As we can see on the scope that math didn’t lie, we are getting values close to our requirements. The output values are a little bit off by a small margin due to tolerance of the components. Important Note: Do not skip the 0.1 uF capacitor at pin #5 of IC 555 which is providing stability from external noises. Skipping will shift the frequency and duty cycle from what we have calculated. 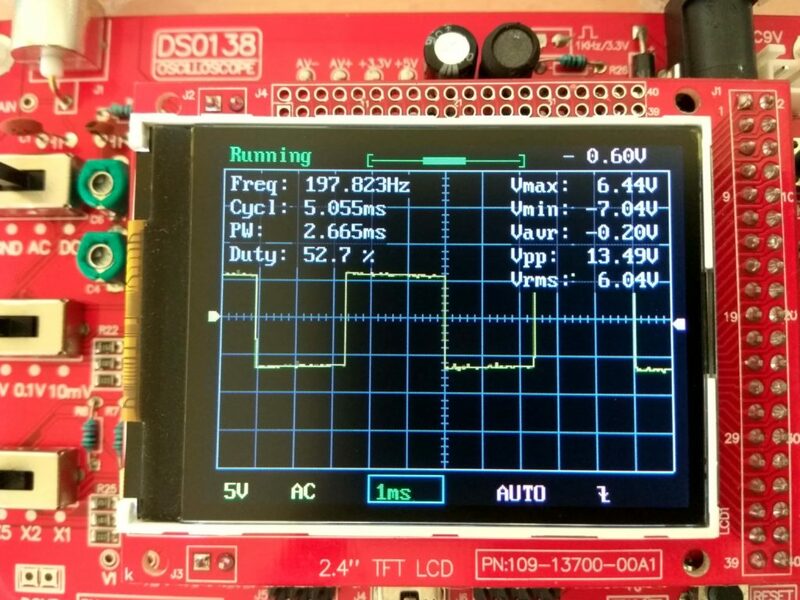 We are applying the 50Hz, 50% duty cycle signal to IC 4017 which is a decade counter, which will produce the modified sine wave, let’s take a look in detail. 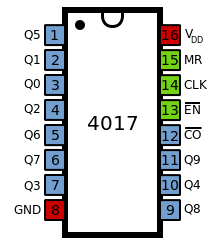 The IC 4017 has 10 output pins and one input pin (14). If we apply clock signal to input pin, each of the 10 output pin will get high sequentially. For example if we apply 5 clock pulses, the 5th output will get HIGH and rest of the input pin will get LOW; if we apply 3 input pulses the 3rd corresponding pin will get HIGH and rest of the pins will stay LOW. Pin 15 can be used for resetting the count back to zero if we don’t want to use all the 10 outputs. For example: Here we are using only 4 output pins pin #3, #2, #4, #7 which are outputs Q0, Q1, Q2, Q3. The pin #15 is connected to output number Q4 or pin #10, now the output pin #3, #2, #4, and #7 will stay active, rest of the 6 output pins stay inactive. Now the 200Hz signal is fed to clock pin of the IC 4017, we are using only the two alternate outputs Q0/pin #3 and Q2/pin #4 and the other two pins are kept unconnected. As we can see, we got modified sine wave at these two pins; this will be applied to MOSFETs for amplifying. 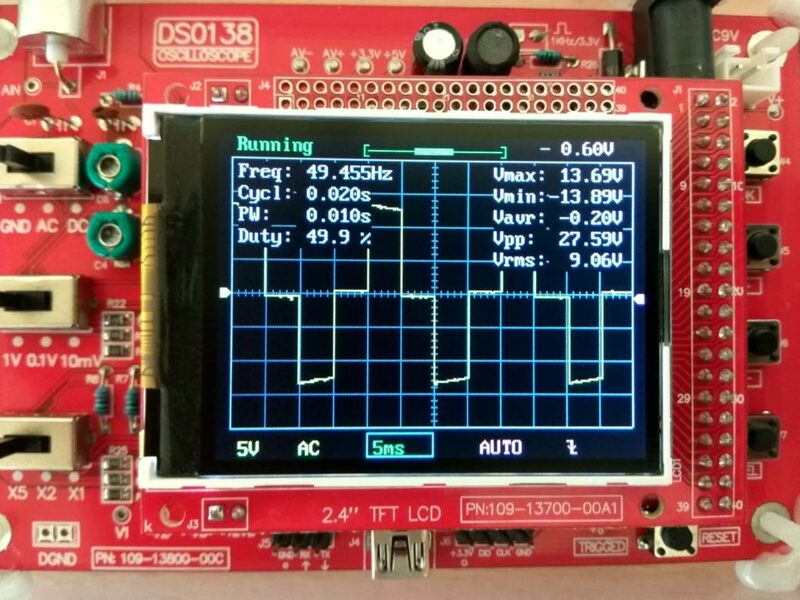 From the oscilloscope readings we can witness that we got very close to the 50Hz and 50 % duty cycle requirement, this is enough for a low power inverter. Now we got 50 Hz, 50% duty cycle signal in modified sine wave form, the output from the IC is too weak to handle the transformer, so we need to strengthen the signal so that we can drive the transformer. To do this we are getting help from MOSFETs which can switch huge current to transformer’s winding with low power signal from the IC. We are utilizing IRF540N which is enough for handing 200 watts of load. We are using an ordinary step-down transformer in reverse to step-up the low voltage to standard 230V/110 VAC. If we choose the transformer’s specification incorrectly we will not get the desired output voltage. Here we have chosen 6-0-6V/20A transformer, you may ask why? Here is the answer: From the scope we can see the RMS value of the output at the IC is 9VAC from a 12V battery, the MOSFET will drop few volt from 12V battery and we will get 6 to 8 V RMS at the low voltage side of the transformer. 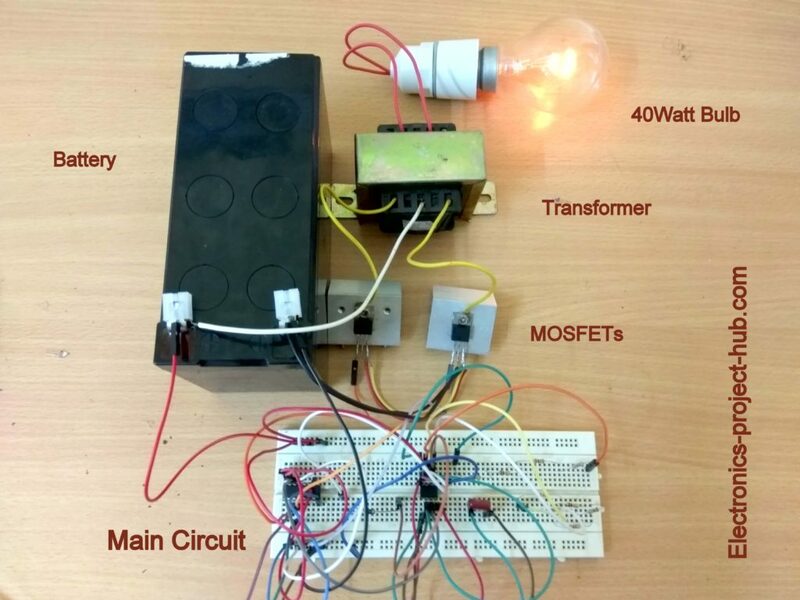 If we utilize a transformer 6V we will get the desired output voltage even at some moderate load. How much power output can we get from this inverter? Assuming we will use 12V 7Ah battery for this inverter then, it could give up to 100 watt output for an hour (approximately). Around 100 watt is the limit otherwise the battery will get degraded soon. If we use 6V/5A transformer 6V x 5A = 30 watts output maximum. If we use 6V/10A transformer 6V x 10A = 60 watts output maximum. If we use 6V/15A transformer 6V x 15A = 90 watts output maximum. If we use 6V/20A transformer 6V x 20A = 120 watts output maximum. If you upgrade the battery with a deep cycle one you can also increase the transformer rating to get more power out of this inverter. If you have any questions, please comment below, you will get a guaranteed reply from us. More strength to your work. 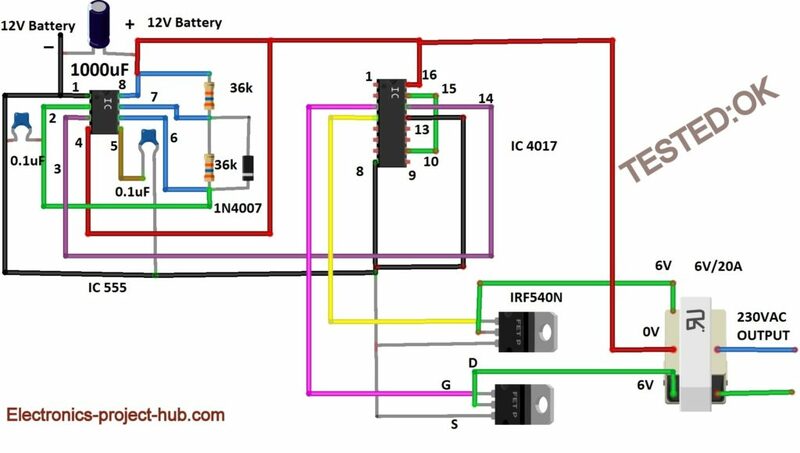 Can i used the above Modified Sine Wave Oscillator circuit to drive the Simple Transformer-less Inverter Circuit – 1000 Watt of your previous post. Yes, you can! but you need to apply Higher than 240 VDC to MOSFETs to get 230VAC output, since the RMS of the modified sine wave is less than square wave. I would like to know if I parallel two transformers of 6V-1A, will I get an output of 6*2=12 Watts? will the whole circuit work? and can I run a load of not more than 10watts? Thank in advance. I just need to do a project for my lab teacher, hope you understand. I tried similar setup (connecting inputs in parallel and outputs in parallel), but it didn’t work as expected, in theory of-course it should work (it has exact same waveform and phase), but practically it didn’t work. If you already have two 6-0-6V 1A transformer you can have a try and let us know. But, my recommendation is to use single 2A transformer or more. I appreciate your opinion! I will let you know of course. Another thing, if I use 12-0-12/ 3A, will it work for this exact setup? Yes, still the inverter works, but the output will be like 160V without load, if loaded the output goes below that, only suitable for mobile phone chargers and SMPS based power supply (as it can run from 110VAC). If the load increased beyond a point and output goes below 110VAC, all the connected chargers stops working.